Liczba stron: 272 Jest to ujednolicona liczba stron, która ułatwi Ci porównanie długości książek. Każda strona Legimi to 200 słów. BYCAROLYN WELLSAuthor of “The Story of Betty,” etc. Why, Grandfather, I—I ran away! Just as the driver was about to start, a voice called, Hi! Hold on there! Betty McGuire stood on the steps of the veranda as she spoke. Her mother, in the doorway, was smiling down at her, and her pony, Dixie, was jingling his bells and pawing at the snow and ice in the driveway below. It was the first trial of the pretty new cutter, and the joyous excitement of the occasion made Betty’s cheeks as red as her scarlet tam-o’-shanter cap, or her red cloth coat with its high fur collar. Betty drew on her driving-gloves, still talking to her mother. The face of the big Irishman beamed with pleasure as he assisted Betty into the new sleigh and tucked the fur robe round her. “Good-by, darling,” said Mrs. McGuire, and after watching Betty disappear down the winding drive, she returned to the house. Denniston Hall, though a beautiful summer place, was equally attractive in winter. Then the wide front veranda was inclosed with glass, and, heated by an arrangement of steam-pipes, made a delightful sun-parlor. The house was of the old-fashioned type that has two front doors opening into two large halls. Large parlors between these halls and a wing on either side, provided numerous rooms, and several of these boasted wide fireplaces where crackling logs blazed gaily or smoldered comfortably, as occasion required. The family at Denniston was a rather unusual one. The place belonged to Betty, the fifteen-year-old daughter, who had recently inherited a large fortune from her Grandfather McGuire. She had supposed herself an orphan, but after buying her home and establishing herself there, she had discovered that her mother was living, and, to their mutual delight, they were at last brought together. Mrs. McGuire had come to Denniston to live with Betty and was more than willing to accept also Betty’s adopted brother, Jack, and the three-year-old baby, Polly. And now, though Mrs. McGuire was nominally head of the household, yet, as the details of housekeeping were looked after by capable Mrs. Kinsey, Betty’s mother had little to do except to enjoy the reunion with her long-lost child. 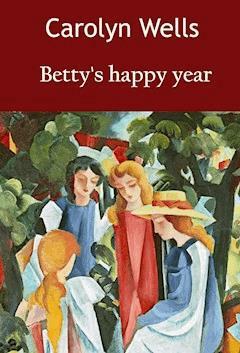 As for Betty, now that her mother was restored to her, there seemed to be no flaw in her happiness, and the merry girl danced gaily through life, like a ray of glad sunshine. Unused to advice or restraint of any sort, she could not at once accustom herself to asking her mother’s permission for anything, but Mrs. McGuire appreciated the unusual circumstances, and wisely concluded to bide her time, and establish their rightful relationship by degrees. Moreover, she was so happy herself, at the reunion with her idolized child, whom she had lost as a tiny baby, that she had no wish to dictate or to interfere with Betty’s plans. Mrs. McGuire was a gentle little lady, with golden hair and blue eyes, and her amiability made her beloved by all the servants and adored by the three children. She had fitted into her niche at Denniston without disturbing any one else, and had supplied the one want of Betty’s life, that of a real mother, who would love her with real mother-love. And happy in the knowledge and possession of this love, Betty felt that life had no further joys to offer her; and she was as contented as any girl of fifteen could wish to be. On this particular sunny afternoon, as she went skimming along the white roads in her new sleigh, her mind was divided between the actual delights of the bracing winter atmosphere and gay jingle of her new sleigh-bells, and her busy imagination which was looking forward to some fine plans that she and May Fordham had in prospect. She drove in through the open gates of a large, well-kept place, and as she neared the house, May, who had watched from the window, came out, all ready for the sleigh-ride. “Oh, Betty, what a beautiful cutter!” she exclaimed, as Dixie paused and stood in prancing attitude to be praised. “And it suits Dix perfectly, doesn’t it?” she added, patting the pony, who showed by his actions that he fully appreciated the applause he was getting. May jumped in beside Betty, and in another moment, away they went, flying along the firm, well-packed road. Betty turned away from the village, and toward the open country, where they might dash over long stretches without meeting much traffic, and thus have a better chance to chatter. “We’ll soon know,” laughed May, as Dixie was gently drawn to a standstill in front of Tilly Fenn’s home. The well-trained little pony always stood without being tied, so the girls jumped from the sleigh and ran up the steps, moderating their gay laughter as they decorously pushed the door-bell. “Come up to my room, girls,” called Tilly, over the banister, as they were admitted. So in a few moments the three chums were busily talking of Betty’s project. “Oh, knee-breeches and long stockings, and bunches of bows at the knees,” said May, who was a history lover. “Yes, and broad white collars, and sort of Norfolky jackets, and broad-brimmed hats,” added Tilly. “With a feather?” suggested Betty. “I don’t believe the Puritans danced,” said Tilly. “Yes, that’s the best,” said May. “Yes, I know some families down there who would be more than glad to get things like that,” said Tilly. Gay good-bys were said, and the two girls went jingling away in the sleigh again. Tilly was not so happily situated in life as Betty and May. She lived with an aunt who, though she took good care of her, was not very sympathetic in the matter of young people’s pleasures, and taught Tilly to sew and to make bread, because she considered such things the important part of a girl’s education. And she was right enough in that, if she had only realized that a girl of fifteen wants and needs her share of fun as well as of useful knowledge. Moreover, Mrs. Fenn was not wealthy, and though she had had sufficient means for comfort, she was economical by nature, and would have considered a purchase of a dress for Tilly to wear just for one occasion, a reckless extravagance. But in spite of her aunt’s restrictions, Tilly was a very gay and merry girl, and was always one of the half dozen that composed Betty’s little clan of friends. “I don’t believe the boys will dress up,” said May, as they drove back to the village to deliver more invitations. Stub Graham was so nicknamed because he was the thinnest and scrawniest boy you ever saw. He was very tall for his age, and the name of Stub or Stubby was so comical that it pleased his friends to use it. Stub festooned his length along a sofa and gave a brotherly tweak to Agnes’s long, thick pigtail. “On Thanksgiving night,” said Betty, and then she told him what kind of a party it was to be. After that it was easy. Very few of the girls they invited made any objection to wearing the Puritan costume, and if the boys objected, as some did, they were referred to Stub Graham, who soon changed their minds for them. “It’s going to be perfectly beautiful, Mother!” said Betty, as, after dinner that evening, she sat on a low stool at her mother’s side. This was Betty’s favorite position, for, though a big girl, she loved to cuddle against her mother and caress her pretty hand, or play with the laces and ribbons of her dainty gown. And now, in their beautiful drawing-room at Denniston, they sat before the big open fire, while Betty told about the party. Jack, who lounged in a big chair on the other side of the fireplace, was greatly interested. To Betty’s surprise he was entirely willing to wear a Puritan costume, though he observed, incidentally, he’d rather dress as an Indian, and Indians were quite as appropriate to the period as Puritans. “It is, isn’t it, Mother?” asked Betty, turning her big dark eyes confidingly to her mother’s loving face. Both Betty and Jack had been deprived of early education, and though they were now studying very hard in a brave endeavor to “catch up” to other children of their own age, they frequently made errors which were quite funny enough to make any one smile. So Jack good-naturedly explained to Betty about Indians in ambush, which was a subject he had quite thoroughly studied in his history lessons. Grandma Jean was Mrs. Kinsey, the housekeeper and general assistant to the children, whenever they needed her capable aid. “And what shall I wear, Mother?” asked Betty, draping the soft frills of her mother’s trailing gown across her own slippered feet. “I like red,” observed Betty, looking down at her own red cashmere frock with black velvet bows on it. Betty’s fondness for bright colors, and especially red, was a household word, and Mrs. McGuire fancied that the novelty of plain dove-gray and white would not be unbecoming to rosy-cheeked Betty. For the next few days nothing was talked of but the old-fashioned party. Pete was consulted about the Harvest Home part of it, and he suggested that an old flower stand which was out in the tool house should be painted up, and put in one end of the dining-room to hold the donations of fruits and vegetables. Then, by adding a few vines and flowers, it could be made an attractive decoration. Ellen, the cook, was quite willing to make all sorts of goodies that were deemed appropriate, and to the lists of baked beans and gingerbread, were added such satisfactory dishes as roast turkey and pumpkin-pie. But no ice-cream or dainty salads or bonbons were allowed, for Betty wanted to keep the real atmosphere of a plain old-fashioned Puritan Thanksgiving. Preparations went busily on, until on Tuesday a letter came from Grandfather Irving. He was the father of Mrs. McGuire, and lived in Boston. Both Mr. and Mrs. Irving had been invited long ago to spend Thanksgiving at Denniston, but had declined because of another engagement. Now, Mr. Irving wrote, the other engagement had been canceled, and they were greatly pleased to say they could go to Denniston after all. Moreover, he announced, they would bring with them a charming young lady who was visiting them. Betty read this letter with dismay. Mr. and Mrs. Irving were of an old and aristocratic Boston family, and Betty rather stood in awe of them. They had not yet been to Denniston, but Betty had made a brief visit to their Boston home. The somewhat oppressive grandeur of the great house on Commonwealth Avenue made a strong impression on simple-minded Betty, and she had determined that when Mr. and Mrs. Irving should visit her at Denniston she would do all in her power to surround them with the careful formality they seemed to enjoy. So when she learned that on the very next day not only Mr. and Mrs. Irving would arrive, but also a strange young lady from England, Betty wished she had more time for preparation. It was in vain that Mrs. McGuire told her that her grandparents were not at all exacting. But Betty was not to be turned aside from her purpose. It was only when Betty grew very much excited that she neglected her final g’s and almost relapsed into her long-discarded Irish accent. But she was so earnest in this matter, that she lost control of her tongue. And so what did impulsive Betty do but jump into her little sleigh, and fly round the village, recalling her invitations to a Puritan Thanksgiving feast, and asking the young people to come instead to a dance in the evening, and to wear their prettiest and most correct party frocks. Then she consulted with her mother and Ellen and Mrs. Kinsey, and among them they planned a dinner that would have pleased the most fastidious diners-out in any city. Betty did not herself know the names of the dishes she wanted served, but the services of a competent caterer were to be assisted by the skilled work of the home servants, and Betty felt that she had done the best she could to honor her relatives with a Thanksgiving feast. Mrs. McGuire tried to persuade her not to give up the Puritan party, but Betty was firm. “All right,” said Jack, who always bowed to Betty’s commands and never presumed to dictate. And Betty was honest in her motives. It was not at all pride in her handsome home and its beautiful appointments that influenced her; it was the impulse to give of her very best to honor her dear grandparents and their young guest, and it was a more severe disappointment than any one knew, for her to give up the gay and jolly party she had planned for. But Betty’s determination was of the immovable kind, and every plan for the Puritan party was dropped, and every plan for the proper reception of the guests was pushed forward; and so ably was all this done, that, on Wednesday afternoon, the house was in readiness and the family, in holiday attire, awaited their guests. The Denniston carriage brought them from the station, and the reunion was a most happy one. Mr. and Mrs. Irving may have seemed a bit punctilious as to the formal routine of their own house, but that in no way interfered with their hearty expressions of pleasure at finding themselves under their granddaughter’s roof. And they soon showed both by joyous words and manner that they were genuinely glad to meet Jack and Baby Polly and Grandma Kinsey. Miss Maxwell was not quite as Betty had pictured her. She was quiet and reserved, but she seemed shy rather than haughty. Betty tried hard to draw her out, but the English girl replied in monosyllables, and though most courteous and polite, was bafflingly unresponsive to the cordial chatter of both Jack and Betty. But he didn’t, for Jack was always on his good behavior when Betty wanted him to be. Next morning, Betty did try. She took Miss Maxwell for a sleigh-ride, but they did not make much progress toward chumminess. It was after luncheon, when the girls went up to Betty’s room for a little chat, that Betty, more perplexed than ever, involuntarily blurted out her anxiety. “Are you like this at home?” she said, scarcely realizing that the question was extremely personal. “Do you never chum with people?” Miss Maxwell broke into a ringing laugh. Then both girls went off into peals of laughter, for Betty’s quick wit caught the real state of the case, and Evangeline, too, saw the truth. “But I thought you so grand I must be extra polite,” said Betty, as they became calm again. So Betty told Evangeline of the Puritan party that had been set aside because of the unexpected guests. Jack came at Betty’s call, and he was informed of the wonderful discoveries the two girls had made concerning each other. He looked a little disgusted at Betty’s lack of intuition in the matter, and said: “Whew! what queer things girls are!” but he accepted the new situation, and set his wits to work to help Betty out. Come they did, every one of them. They wore quaint Puritan costumes, which were delightful to look at, if they were made of such humble materials as cheese-cloth and silkoline. The boys were stunning in their picturesque suits, and the dining-room was truly old-fashioned with its onions and red peppers strung from the rafters. The homely viands were eaten with decided enjoyment, and afterward even old Mr. Irving joined in the Virginia Reel. “Such as?” demanded Jack, her adopted brother.